Singapore was never really on my travel list until recently when my friends Paul and Rebecca moved there. Lucky for me, I had the best tour guides a girl could ask for who had lots of local knowledge on what to see, where to eat and what to do. It wasn’t long after I had arrived that left me wondering why I hadn’t visited earlier. On this trip, I was lucky enough to be there for New years celebrations but more on that later. You don’t need your winter woolies at any time of the the year as the average temperature all year round is 32 C (90 F), unless of course the air condition is way too high in a taxi, restaurant or shopping centre. Any kind of littering (including spitting) is an offence that you can get fined up to $1000 for. 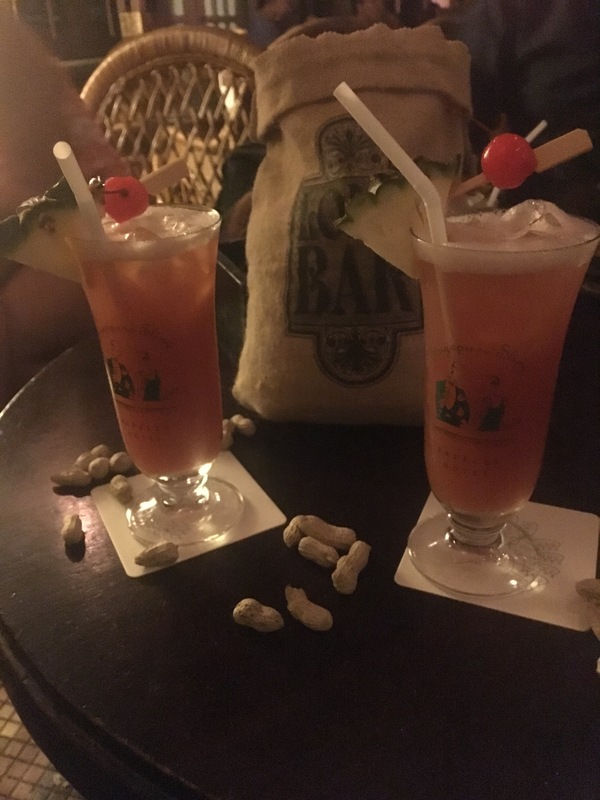 Go to Long Bar at Raffles for a Singapore Sling where this cocktail originated (in 1915) made from gin, cherry liqueur, Grenadine, pineapple and lime juice. One of the more expensive cocktails I’ve had at $31 SGD. You’re also served shelled peanuts here where they allow you to throw the shells on the floor, which adds a fun element to the experience (without getting a fine for littering 😊). We had a a great Chili Crab (which is a popular and typical local dish) at the Blue Lotus on Sentosa Island. We also ordered lots of shared dishes including the Szechuan style spicy chicken and king prawns. The food was delicious and the restaurant had a great ambience and vibe by the waters edge. I highly recommend doing the Skyline Luge also on Sentosa Island. It was entertaining and carefree and it was an attraction that took me back to my childhood. This activity is so much fun, you can go at your own pace and is suited for all ages. After the Luge, enjoy a beachside drink at one of the plenty bars (like we did) or you can take the chairlift back to the top and enjoy the scenery along the way. Paul and Rebecca kept insisting that I try an ice-cream sandwich. Who eats ice-cream in bread??? I’d rather save my carb loading for fries but I eventually gave in and tried one. I have to say I was pretty impressed! You can find street vendors selling them in carts on the street. They are literally a block of ice cream (that come in various flavours) wrapped up in a slice of sweetened white bread. Lantern at the Fullerton Bay Hotel – I really enjoyed our night here at the rooftop bar. Not only did they have a great DJ that played cool music, the mojitos were great as were the undisturbed views of Singapore and the iconic Marina Bay Sands hotel. Ce La Vi Club Lounge – is at the top of the iconic Marina Bay Sands. It’s right next door to the famous infinity pool. Apart from the stunning view of the Singapore skyline, I loved the music they were playing there too. New Asia bar @ Swissotel Hotel – we spent New Years Eve here with prime VIP seating on the 71st floor. It is a club so take note if you don’t like loud music or dancing. I enjoyed the music and the view of the fireworks was great (if you could push your way through the masses). 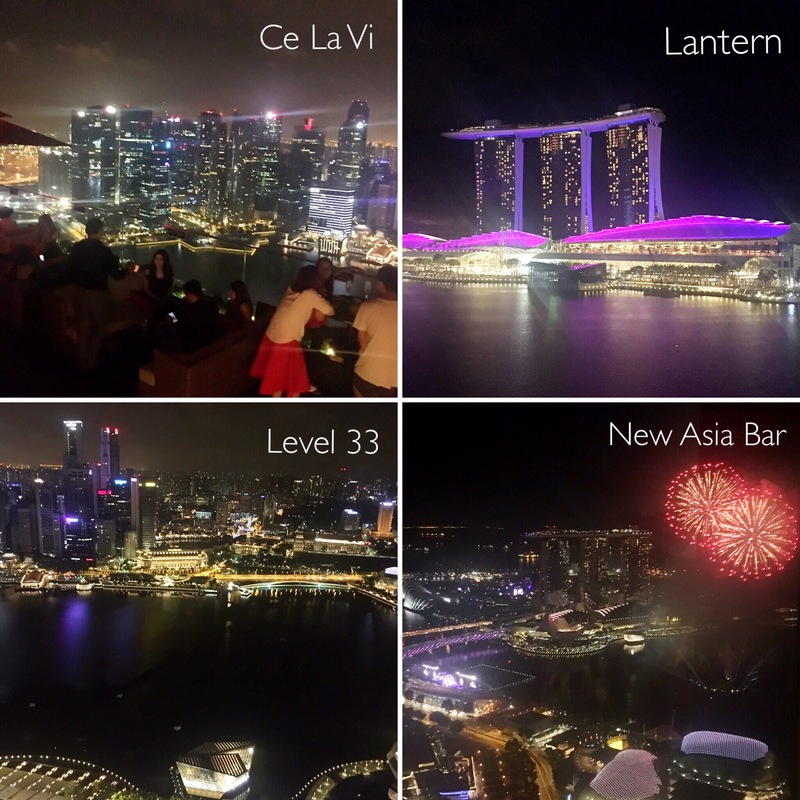 Level 33 – We paid a brief visit to this bar and again the views of Singapore were amazing, so be sure to book or ask for a table outside. Not that I’m a beer drinker but I did happen to notice that they brewed their own beers inhouse. 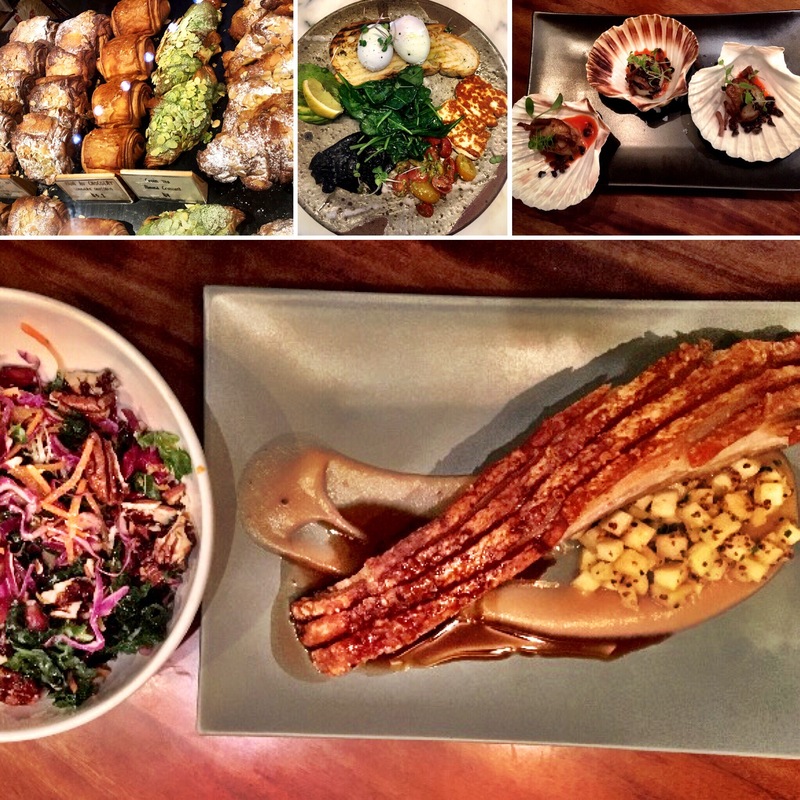 Bread Street Kitchen – is a Gordon Ramsay restaurant located in Marina Bay Sands. I was excited to see Pork Belly on the menu which is a favourite of mine and something I don’t cook at home, so of course I had to order it and it did not disappoint! Tiong Bahru Bakery – the coffee here was fantastic and of course we couldn’t go past the sweet treats without trying the Green Tea croissant which got my vote. Common Man Coffee Roasters – this place is owned by two Australians and I was pleasantly surprised at the breakfast dishes on the menu. Not only is the coffee excellent, the food was too. It is a popular place so expect a bit of a wait. Luxe – We came here for brunch and the ambience which was quite chilled. The menu was very Australian and the food was great including the Luxe Bowl that I thoroughly enjoyed. There was so much to see and do in Singapore and would I definitely go back because there are more adventures to be had. Even though we were only there for 5 days, we also managed to squeeze a lot in. Chinatown – I loved the energy in this area. Not only were there streets lined with restaurants, shops and market stalls, there were colorful displays at every turn for Chinese New Year celebrations. Little Arab town – A colourful narrow lane called Haji Lane is filled with charm and character and lined with independent designer boutiques that sell eclectic and one-off items. Orchard Road – is Singapore’s famous shopping street where you can indulge on retail therapy. You will find a vast array of malls and international brands ranging from high end to low end. The underground tunnels allow you to cross to the other side of the street without the worry of traffic or getting wet when it’s raining (and the discovery of more stores!). We were lucky enough to be there for the Christmas lightup where the street is lined with dazzling lights and the malls are decorated beautifully too. Loved your Singapore post! I will definitely try to hit some of the rooftop bars and eateries that you recommended.